My Easy A front is still a few inches away from being finished, but we're doing a run of the whole play tonight, and I'm hoping to get it finished at rehearsal. Yesterday I wanted something more portable to bring to choir, and I pulled my Darjeeling socks out of my WIP bag. Longtime readers will probably recognize this project, as it's been a WIP since 2012 (making these my oldest active WIP), and I've had plenty of setbacks along the way. When Darjeeling last appeared on the blog, I was getting ready to frog it for the third(?) time, and modify it for my preferred construction. 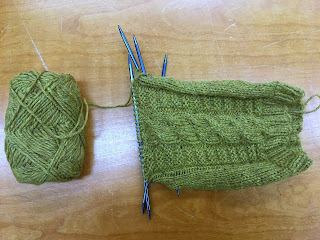 Yesterday I finished the leg and the heel, and I'm about halfway through the gusset decreases now. 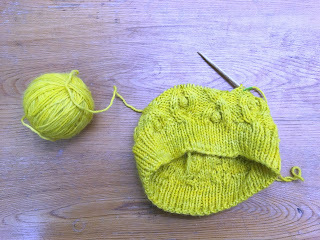 I'm still as charmed as ever by this yarn and the stitch pattern. and I really can't wait to have this pair finished and on my feet. 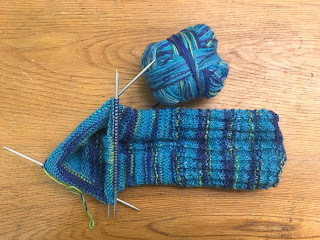 I'm definitely not the prolific sock knitter I was in college, so I'm not even going to pretend these will be finished anytime soon, but it feels great to reach the halfway point on this sock and not have major issues. I feel like I've been "almost finished" with the front of my Easy A all week. 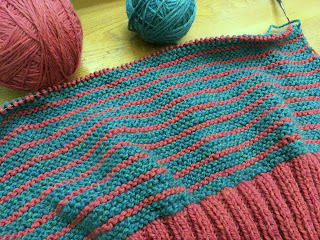 I'm constantly reminding myself that just because this knits up quickly doesn't mean that it knits up instantaneously. 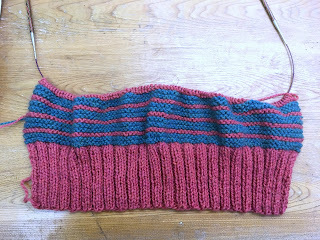 There's about six inches left in the front, which is really only a couple hours of knitting, so I'm sitting pretty good. This weekend we really need to finish getting all our xmas stuff packed up, and I also have an absolute mountain of library books that I need to get through. It'll be a miracle if I can finish just one over the weekend, but I'm going to try. I also have to be off-book for play practice after the weekend, so I'll be spending lots of lovely quality time with my script over the next few days. 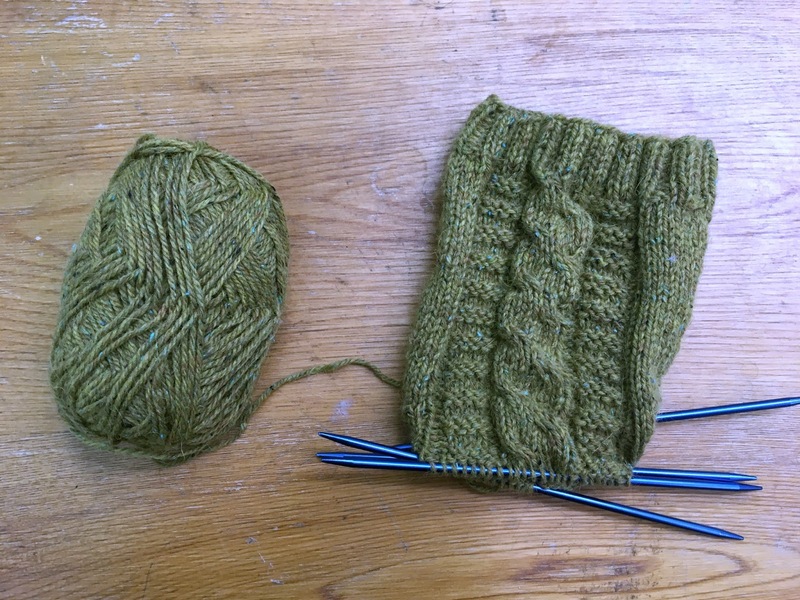 I finished my first legwarmer over the weekend, and I'm already a couple of repeats into the second one. I'm mirroring the cables on these because I really love how mirrored cables look across two items of a set. It's an extra detail and layer of thoughtfulness that I really appreciate. It did get super cold again over the weekend - in the negative 30s! - but now we should be in our January thaw for the rest of this week. It's even supposed to get above freezing the next couple days, so hopefully I'll be able to bang this second legwarmer out and have a finished pair waiting for the next deep freeze. In theater news, we've finished blocking and tonight we're doing our first stumble-through of the whole show. I'm planning on bringing my Easy A-long sweater to rehearsal tonight to take advantage of the time I won't be onstage, and hopefully I'll get several more inches knit up! Last night I managed to finish my first legwarmer, and I tried it on and it was perfect...and then I noticed that I'd added in half a repeat sixteen rounds back by mistake. So I ripped out back to the mistake and fixed it and I'm about halfway done the top ribbing on that legwarmer now. I managed to bang out several inches on my Easy A-long sweater front, and I'm loving it. 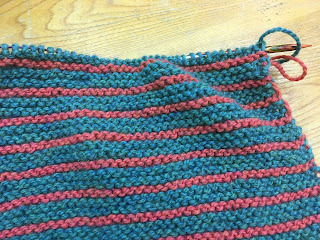 It's worked out that each green/pink stripe is one inch, which is going to make tracking measurements so easy. 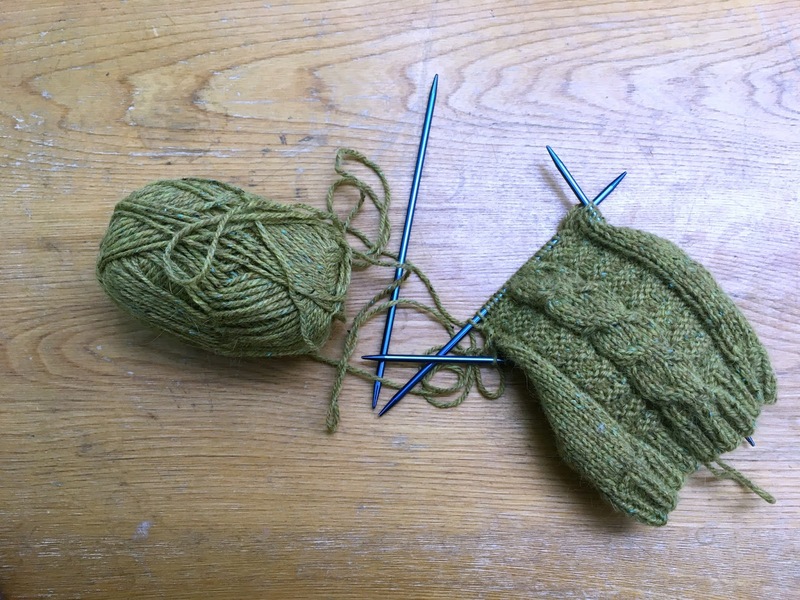 I have play rehearsal again tonight, but we're actually starting blocking today, so I don't know exactly how much knitting I'll manage to squeeze in during practice. 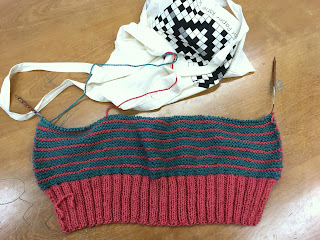 My first legwarmer is almost halfway done, and I'm hoping to get it finished this weekend. This has been my lunch knitting all week, and in the evenings I've been alternating between a new design project and my Easy A-long sweater. I haven't gotten quite as much done yet on my Easy A as I thought I would have, but we're only on Day 5 of the KAL, and this will be perfect rehearsal knitting for the new play I'm in, and rehearsals for that start on Monday. Our current heat wave is supposed to last through at least the next ten days, so with any luck my legwarmers will be finished long before it gets too cold to go without them. I'm working on writing up the pattern for these as well, which I'd love to have ready yet this month, or early February. I carried over plenty of projects from 2017 (and 2016, and 2015, and...let's not think about it), but I've already gone and cast on my first two of 2018. The first is my new Easy A for the Easy A-long (today is the last day to save 20% on the pattern with code EASYALONG and there's still plenty of time to jump in and join us!) 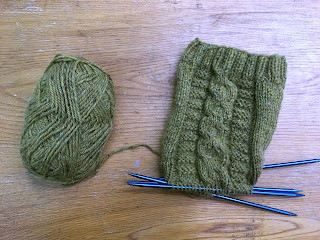 and the second is a pair of legwarmers. I wear a lot of skirts and dresses, but for some reason I haven't owned a pair of legwarmers in years. The past couple of winters have been on the mild side, so I haven't really had a problem walking around in tights, but last week we were hovering in the -30s Fahrenheit, which is just too cold to not have pants or legwarmers on. 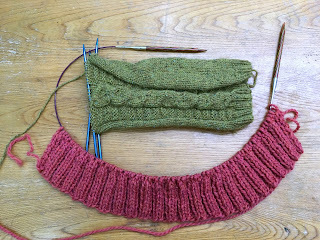 The first one is going pretty smoothly so far, and I'm planning on mirroring the cable on the second one to help with second-legwarmer-syndrome. 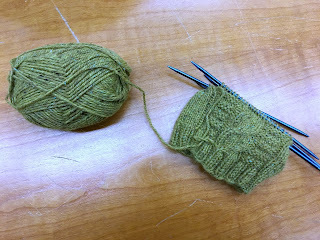 I'm really enjoying knitting it so far, but I definitely want to get these churned out before it gets super cold again.